Billy Johnson, played for tiny Widener college in Pennsylvania. Going unnoticed- despite his white shoes and penchant for big plays, numbers, and great speed, the Oilers said, “Why not?”, and drafted White Shoes in the 15th round of the 1974 draft. There the fan favorite Johnson lit the NFL on fire with his breathtaking speed at returner and his entertaining end zone celebration called ‘The Funky Chicken’. (Johnson’s dance, is still celebrated today as one of the first, and was the Granddaddy to such dances as: Ernest Givins‘ “Electric Slide”, Ickey Woods‘ “Ickey Shuffle”, and Jamaal Anderson’s “Dirty Bird”.) White Shoes played during the heyday of the Luv’ Ya Blu era in Houston, alongside Dan Pastorini, Ken Burrough, and Earl Campbell. He set an NFL record in 1975 by returning 3 punts for touchdowns in a single season. Not to be outdone that year, he also had a kick return as well, earning him AP honors and the Pro Bowl MVP after the season. White Shoes continued to set the standard for electrifying play throughout the 70s and the crowd always held their breath with excitement when he took the field. He again won AP honors topping his 15.3 YPR average from ’75 with a 15.4 YPR average in 77, with 539 yards and 2 touchdowns. As a kick returner he was also equally amazing, scoring another touchdown there as well. A catastrophic knee injury wrecked his 1978 and 79 seasons. After a final season in Houston in 1980, White Shoes travelled north to the CFL for a year doing everything for the Montreal Alouettes. 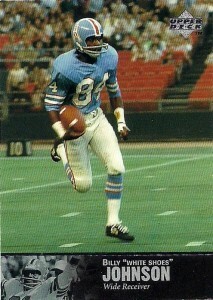 The Falcons gave him a shot in 1983, and Johnson not only made the roster of the team, he had also matured as a receiver. 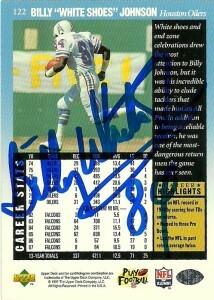 Although he only started one game that season, Billy had 709 yards receiving and 4 touchdowns, (both career highs,) and was named NFL Comeback Player of the Year. In ’83 he scored another touchdown on a punt return, and was named AP and back to the Pro Bowl again for a 3rd time. He posted career highs again in 1984 in receiving with 830 yards and 5 touchdowns. Playing one final season in Atlanta, White Shoes went on to Washington and retired after the 1987 season. He’s been named to the NFL 75th Anniversary team and also the All-Decade Team of the 1980s. It took me some time to get my autographs back from the Fiterman event but I finally did get my cards back some 3 weeks after the event. The company did apologize and adjusted their time-frame for delivery expectations for TTM on their website. I like to have my cards autographed on the front, but based on the report from Fiterman, White Shoes apparently refused to do so because he was not wearing white shoes on the front of this card. Still I am happy to knock out an elusive signer, after a previous attempt and failure.